Even though we've been at 1820 Broadway since 1888, we strive to be a community in step with change. Different things motivate us to connect with a church. Maybe you'll discover Trinity is in shape with what you're seeking. Everyone is welcome here. Name a box to check and chances are great your box is here. Continue to browse and be well! Keep reading to learn about the first 100 years of Trinity's church community. On August 2, 1859, Adriance and Goode reached Denver City and established the Auraria and Denver City Methodist Episcopal Mission, known today as Trinity United Methodist Church. Growth in the region was slow over the next ten years. In 1860, Denver City and Auraria voted to unite under the name “Denver City” and on February 28, 1861, President Buchanan signed a bill making Colorado a territory. The newly formed territory prospered, as did the Methodist Church. More settlers arrived, congregations grew and the Rocky Mountain Conference was established in 1863. 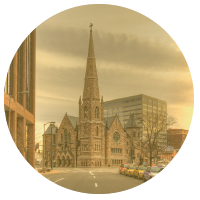 The church purchased land at the corner of 14th and Lawrence Streets and commenced building a “substantial brick church eligibly located in the city.” Denver First Methodist, colloquially known as “Lawrence Street Church,” was completed and first services were held on February 12, 1865. Denver City flourished with the advent of the railroads in 1870, and Lawrence Street Church became the hub for social, musical and religious activity. In the next ten years Denver City’s population grew from 5,000 to 35,000; many church members moved to the newer suburban areas causing the church to consider relocation. Land was purchased at our current location of 18th and Broadway, with plans to build a church by 1888. Robert S. Roeschlaub was hired as the architect, and by September 5, 1887, architectural drawings were finalized and the foundation’s cornerstone was placed. The first service in the new building was held on Easter Sunday in the unfinished “Lecture Hall” (now the Fellowship Hall). Upon completion, a capacity crowd of 2,000 filled Trinity Methodist Episcopal Church’s new sanctuary. The Rocky Mountain Christian Advocate reported, “The morning service began at 10, an hour earlier than usual, with a choir of 116 voices marching into the sanctuary. Then, the great organ, as if conscious of the mighty success to be celebrated, pealed forth its note of triumph. The first hymn, ‘Holy, Holy, Holy, Lord God Almighty!’ was announced by the pastor and sung with great spirit by the congregation." Trinity is one of the finest examples of “modern Gothic” architecture in the United States. According to definitions of design, “the church is an auditorium clothed in a Gothic shell.” What made the building “modern” in 1888 was the marriage of Gothic detailing and a Rococo theater with the latest technology. Trinity’s architect, Robert Roeschlaub, stayed true to the Arts and Crafts movement of looking to nature for inspiration by building the exterior with locally quarried Castle Rock rhyolite. Building Trinity’s steeple, which stands 183 ft. 7 1/2 in. from the ground, was a magnificent achievement of Roeschlaub’s career as a church architect. At the time of construction, it was one of the tallest stone towers in the United States. 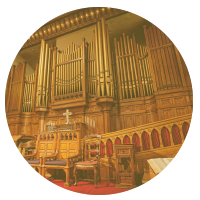 In 1888, Trinity’s Music Director, Isaac Blake, was entrusted with full responsibility for the organ selection and installation. Additionally, Blake committed to cover the full cost of the project, $30,000. The organ was designed by the Roosevelt Organ Works of New York. Frank Roosevelt finished construction in 18 months and personally supervised the five months of shipping and installation. The electricity needed to power the organ’s electro-pneumatic action was originally generated by a dynamo. The dynamo was turned by a water wheel which gained its power from an artesian well below the sanctuary. Behind the 108 pipes in the organ’s facade are an additional 4,167 pipes, making the total number of pipes 4,275. At today’s estimation of over $2,500,000, Roosevelt Opus No. 380 is one of the largest Roosevelt-built organs of the 19th Century still in operation. Trinity’s stained glass artwork was designed by Healy and Millet of Chicago. The firm was considered an innovator during the Arts and Crafts movement. Their artists use colored and textured opalescent glass, instead of the painted glass method of the day. The two rose windows are identifiable by their twelve spokes, which symbolize the 12 apostles and the 12 tribes of Israel. The three–panel Resurrection window at the rear balcony used a painted glass application. The outstretched arms of the angel became its focal point, meant to welcome all people. 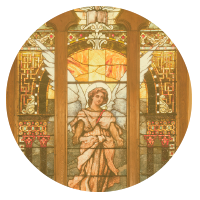 Since the installation of the windows in 1888, the Watkins Stained Glass Studio of Englewood has repaired and maintained Trinity’s stained glass artwork.